After 10 months on the road, we finally took the plunge and did some remodeling. Well, I watched and Allen did his thing. First, we made Lizzy an official bedroom in the den/kid room/Playstation room/the room that wasn't being utilized enough to be in the RV. So he took out the couch and shelves that were being wasted behind it and built a bed frame. 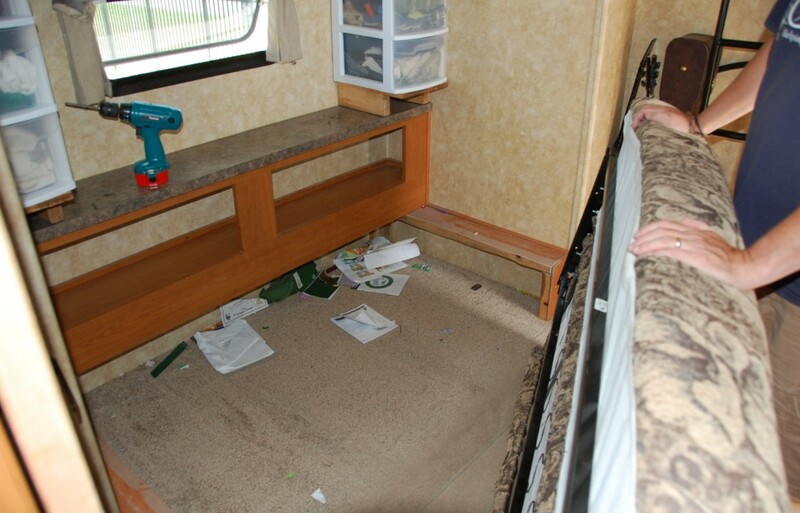 Now she has a great space that doesn't have to be converted to a bed and doesn't store junk. Paint and curtains to come later. 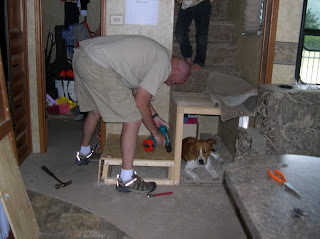 Then Allen & the kids surprised me with phase II of our remodel and removed a wall and stairs. (They even took the pics they knew I'd want! Though honestly, I'd have closed the door to hide the other mess.) The wall was decorative (and heavy) and while we liked it, we'd rather have extra space in our living room. 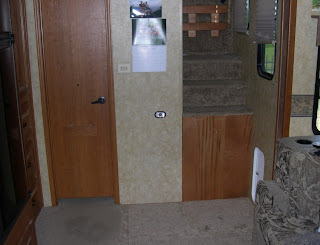 We replaced those with a bench, which provides extra seating, storage inside, and lets us still get upstairs to the boy's loft. They also have a ladder in Lizzy's room. We love it now! As does the dog. :) We'll decorate the wall now. Still thinking about painting. 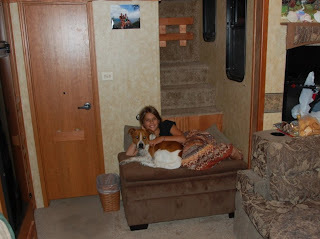 So now it's much better for this fulltime RVing family! 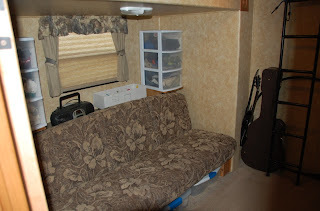 Want to see how other fulltime RVing families make their RVs home? Check out the FOTR Blog Carnival for May! When are ya'll visiting Texas?? We have some work for him! 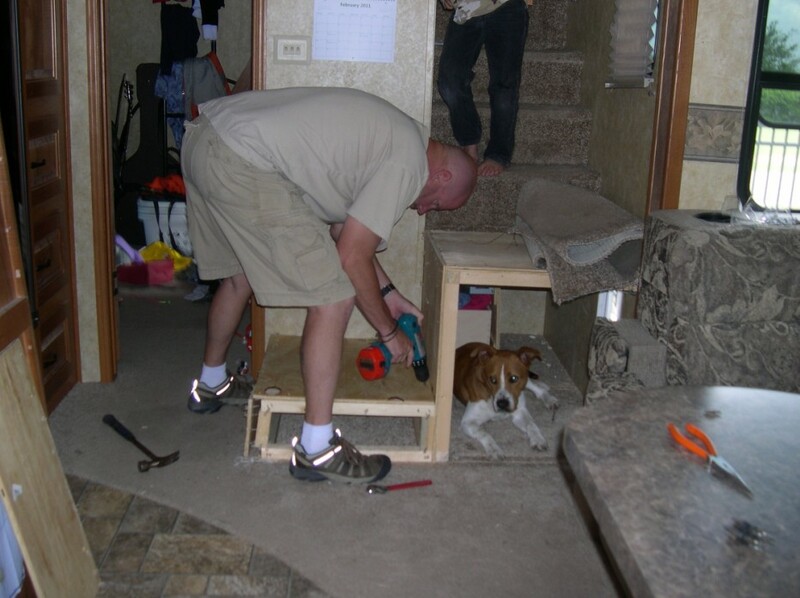 lol... We are just afraid to do anything to our RV! Love it! so inspiring. We got rid of two of our dining chairs... replaced it with a sofa bench that fits three kids and turned the table sideways - whoo hooo! Love how a little goes a long way! I wanna know when ya'll will be in Texas too...not because we need an RV remodel (since we don't have one yet)...but just cause I've been following your blog for quite a while now and would love to meet ya'll!! LOVE the pic of dog!! Is he trying to help or just be as close to Allen as possible? Maybe a little of both!! I see what you're talking about. It looks great!! 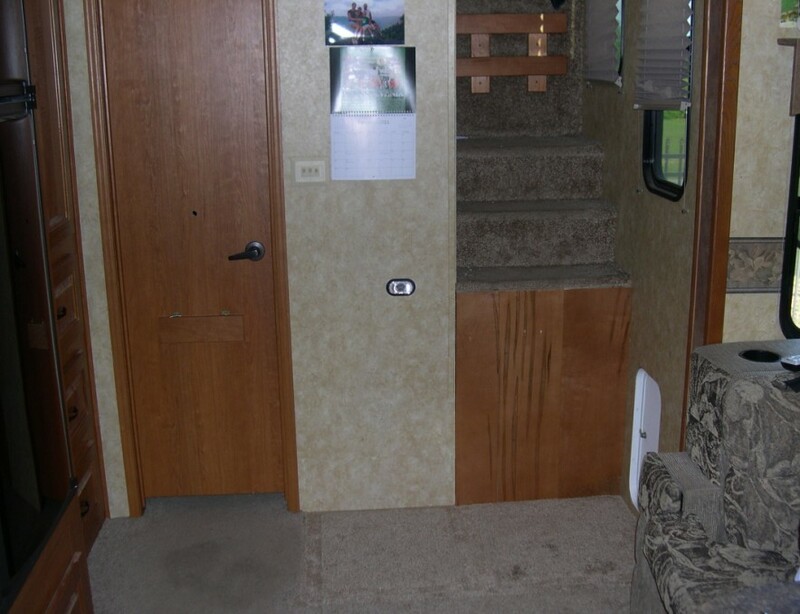 and it looks like so much more room!! I can't wait to see how Lizzy continues to decorate her room. I love your remodel! Your daughter's room is so cute! 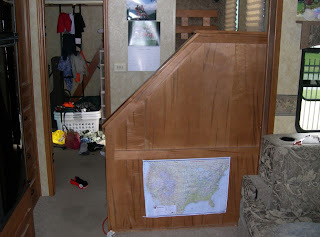 We are getting ready to move to an RV, we haven't bought the RV and I'm already thinking about the remodeling! It's so much fun. Congratulations, your home is beautiful! Looks great! Have you guys done anything with the deadspace above where the folding chairs were/are stored in the dining area? Hi there! Found you through FOTR! I love following other FOTR....so I am going to 'follow' you. If you get a chance, stop in and see us too! We are actually not on the road at this very moment (very rare) but we usually are and are HS'ing with two kiddos. We miss being out in our RV SO badly when we are at our 'stick' house. The road just calls. Love to have other families to relate to! (: Come by if you can! 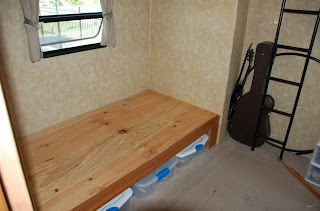 Having that room for the kids makes such a huge difference. I really think that it just a huge difference to everyone's sanity to have that bit of 'space'. And getting rid of anything heavy is good -- fuel costs way too much! That looks great! 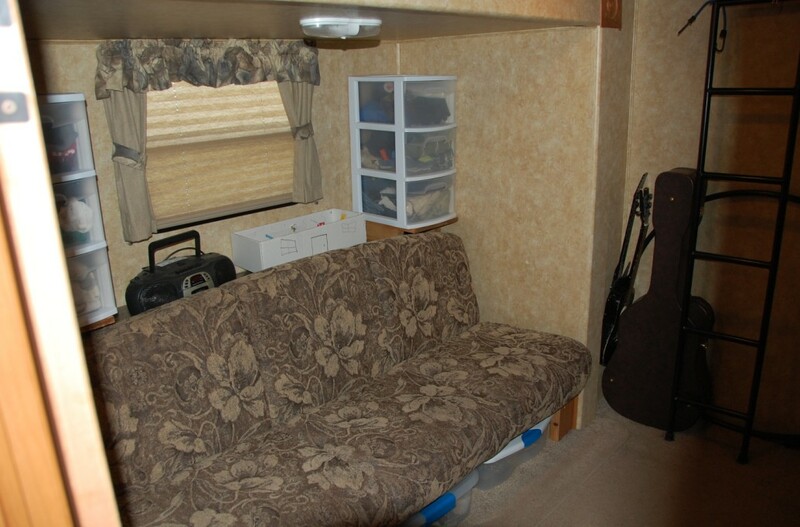 Love the RV it seems to be big and very spacious, looks like we have to get our camper van swapped for a better and bigger one. 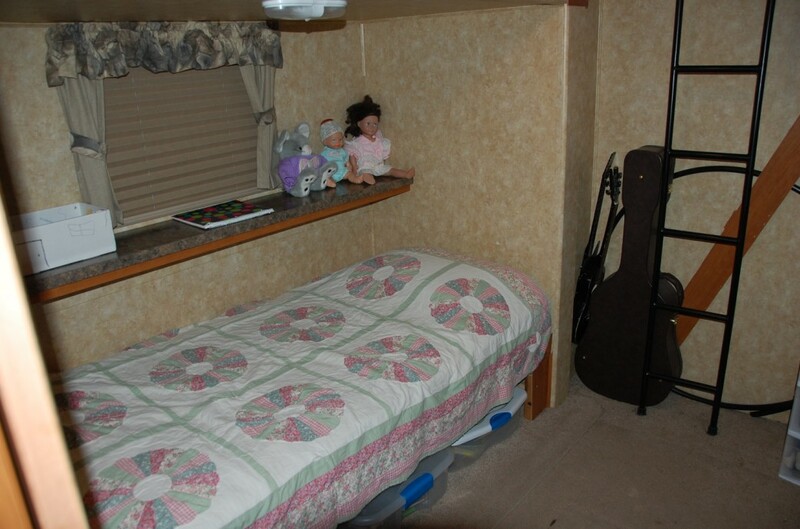 Our kids will surely love a space of their own and would love to travel in a most comfortable way.